If you spot a long line at a hawker stalls in Singapore, chances are that whatever one dish is being sold there is pretty darn amazing. Tian Tian in Singapore’s Chinatown (inside the Maxwell Food Centre), always has a ridiculous line outside – even at 3PM (which is when we arrived for our mid-afternoon “snack”). I guess it doesn’t help that Anthony Bourdain visited Tian Tian on his Travel Channel show No Reservations and proclaimed it the best chicken rice in the world. 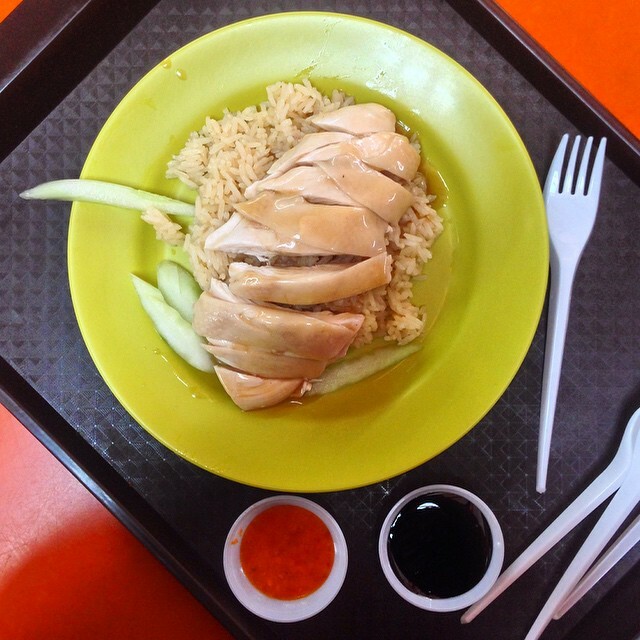 Or that Tian Tian’s chicken rice beat out Gordon Ramsay’s version in a Hawker Heroes Challenge in 2013. We had already eaten lunch that day and had plans for dinner. I was curious about Tian Tian, yet hesitant to overeat. “Let’s just get one. You and I can share it,” said Bryan. Bryan loves chicken rice, and immediately jumped into line, perfectly willing to wait to try this super famous dish. Tian Tian Chicken Rice is inside the Maxwell Food Centre, an indoor building located right on the edge of Chinatown. This food centre felt more authentic, with simple, unadorned stalls serving all different types of food. Contrast this with the rest of Chinatown, which has been painted and decorated to look so pretty, you almost think you’re in Disneyland. It’s definitely the cleanest Chinatown I have ever encountered. Inside the main Chinatown area, there is another outdoor food court area that is much prettier than Maxwell. I can’t comment on the food there, although I have a hunch that the food inside Maxwell is much better. Tian Tian is a family owned business that, due to its popularity, has expanded to several more locations within Singapore. The one at Maxwell Food Centre is the original, and still looks the same as it might have looked back when it first opened (minus all the Anthony Bourdain quotes and various press clippings). Chicken is gently poached for 30 minutes before resting for an additional 30 minutes. What results is this super velvety soft meat. The broth and chicken fat are used to flavor the rice, which is incredibly fragrant. Each chicken is painstakingly chopped by hand. The line is always long, though we ended up waiting around 20 minutes, which isn’t too too bad. The lines moves pretty quickly. You can see Bryan way at the end of the line (he’s actually standing outside). That gives you a sense for what a 20-minute wait looks like. Due to the fact that it was neither lunch nor dinner, we stuck with just one order of the Hainanese Chicken Rice. You have to request the sauces, so definitely do that. The aged dark soy sauce is phenomenal (I was almost just eating it on its own), and the spicy red sauce is a nice addition as well. The chicken rice was fabulous. The chicken was velvety soft, the rice was delicious fragrant with a rich and intense chicken flavor (probably from the chicken fat!). The gravy over the top plus the sauces added an additional dimension of complexity to the entire dish. We loved it. Of course, we didn’t try any other chicken stalls, so it’s hard to objectively compare. My guess is that most of the stalls are pretty tasty. If you really don’t have the patience to wait at Tian Tian, you’ll probably do just fine going to another stall. However, if you’re already in Chinatown, it’s hard NOT to try this crazy famous chicken when it’s been lauded by so many around the world. This is the 15th post in the Malaysia and Singapore! series and the first one covering Singapore. Other posts in this series include Lot 10 Hutong – Kuala Lumpur’s Most Famous Hawker Stalls Under One Roof, LaZat Malaysian Home Cooking, Otak, Otak Fish Dumplings in Banana Leaf, Little Penang Cafe + Visiting the Petronas Twin Towers, Roti Jala – Malaysian Lacy Pancake, Nonya Malaysian Chicken Curry. Bijan, Onde Onde, Jalan Alor -Kuala Lumpur’s Most Famous Food Street, Walking Food Tour of Kuala Lumpur, Mamak – Malaysia’s Indian Muslim restaurants, Hiking the Rainforests in Malaysia (and swimming the waterfalls!) with Open Sky Unlimited, and Din Tai Fung, Marina Bay Sands. I’m from Singapore but I’ve never eaten at Tian Tian! I really ought to try it one day when I’m back. It’s been fun checking out your posts on Singapore! I’m the same as Sharlene but living in Melbourne now. Never tried Tian Tian as well. Felt there are other chicken rice stall equally good. Old Airport Road food center is good too. Check it out if you visiting Singapore again. Tian Tian chicken rice is not good at all, dry. You need the local to tell you where is the best chicken rice and not the celebrity.